I sometimes get exasperated with hostile-angry couples and think, “Why don’t you just grow up?” There is a feeling of being overwhelmed and wanting to give up. Do you have any perspectives on how to keep my head above water? Rachel nailed it with that exasperated feeling. 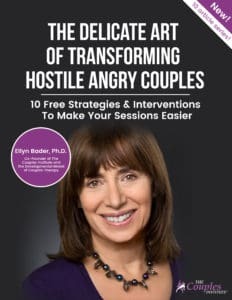 One of the most frustrating aspects of working with hostile angry couples is that even your best interventions never seem to hold. You think you’ve made a breakthrough and when they come back next week it’s gone. Do you blame yourself? Do you blame the partners? Let’s look at why it’s so hard to get traction with these couples. If you really loved me, you would read my mind, know what I want, and give it to me in a timely way. I shouldn’t have to ask. If you really loved me, you’d make me the center of your universe and give up old significant relationships for me. Friends and family should always come after me. If you really loved me, you would want closeness and intimacy when I want closeness and intimacy. You would want it when and how I want it. If you really loved me, you would change your personality to please me. I’ve given and given all I can. Now it’s my partner’s turn. I can sit back, do nothing, and wait. When partners hold steadfastly to these beliefs, they treat their requests for developmental change like they should be easy and effortless behavioral changes. By the time they come to see you these patterns are predictable and enduring. To interrupt these patterns takes something counter-intuitive. You must not focus on their problems too soon. There is such a strong tendency to jump in and focus directly on their problems too fast. But you’ll keep getting pulled into recurring challenges unless you lay a strong foundation first. Once you know the order in which to do things, you’ll stop feeling like a ping pong ball in the middle of a fierce competition, with partners lunging and swinging at you from both sides. Instead you will know how to chart a clear path forward. In the articles ahead, I’ll describe more about laying a strong foundation. In my Developmental Model training program, I teach therapists not to jump into problem-solving too quickly. Instead I teach them how to focus on why the couple is there, increasing their motivation, defining the kind of relationship they want to create and getting self-directed goals. When my program opens up twice a year, it fills up quickly. Word has gotten around that the Developmental Model fills in gaps missing from other training. If you want to be guaranteed a spot, sign up for the waiting list here. #1 7 Traits of the Hostile Angry Couple. #6 How Do You Build Trust? #7 What Can Bruce Lee Teach You About Angry Couples? #10 What do diets and fighting couples have in common? I am interested in more couples training. I work with abused women in Malaysia.